REDWOOD SHORES, Calif., July 18, 2017 /PRNewswire/ — Oracle today announced it has been named a leader in the Forrester Wave™ Digital Process Automation (DPA) Software report. This placement confirms leadership for Oracle Process Cloud, which is part of Oracle Cloud Platform. "By delivering comprehensive process automation capabilities such as no- and low-code process design, case management and simplified connections to SaaS, Social, Cloud and on-premise systems, Oracle provides customers with a powerful option to continuously deliver engaging customer, employee, and partner experiences at every stage in their business transformation journey," said Vikas Anand, vice president, product management, Oracle. "Today business process automation augmented with intelligent machine learning is helping organizations drive best next actions and provide them with better, timely decision making capabilities." In Forrester’s 30-criteria evaluation of DPA vendors, they evaluated 12 significant software providers. Oracle was cited as a leader with the highest possible scores in the low-code/no-code, smart forms and user experience, process flow and design, mobile engagement, API support, data virtualization, deployment options, and ease of implementation criteria. Download Forrester’s Wave report for "Digital Process Automation Software, Q3 2017" here. Oracle Process Cloud Service was built from the ground up for the cloud to provide enterprises of all sizes with the low-code app dev platform that they need to build business agility and control their digital destiny. 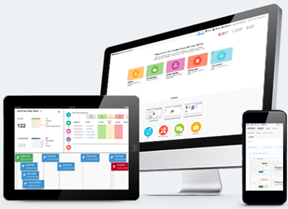 With full lifecycle support for end-to-end process automation spanning departments, SaaS apps, and on-premises systems of record, Oracle Process Cloud Service empowers business analysts and process designers with the tools they need to rapidly deliver differentiating experiences in a collaborative manner. Oracle Process Cloud Service comes with Quick Start App templates and pre-built integrations to companion platform services including, Content Management, Integration, Mobile, Intelligent Bots, and IoT Apps, to enable rapid delivery of engaging experiences across channels and devices. "Process automation is central to our integration strategy," said Ravi Gade, senior director of apps IT and digital transformation, Calix. "Calix leverages Oracle Process Cloud to reduce IT backlog, ensure compliance, and simplify connections across our rapidly evolving SaaS and on-premises business systems." "Using a combination of Oracle Process Cloud Service and Oracle Application Builder Cloud Service along with the cloud-native best practices introduced by our partner, Rubicon Red, we have a comprehensive, integrated cloud platform that enables us to deliver innovative, modern solutions," said Ryan Klose, general manager, corporate, National Pharmacies. "The Oracle Cloud Platform gives us flexibility to connect to all our core systems, and easily deliver to a range of user interfaces, whether they be online, mobile/tablet, devices/IoT, or emerging chatbot technology." "Oracle Process Cloud Service has allowed us to dramatically shorten our time-to-market by up to 40 percent," said Matt Wright, chief technology officer, Rubicon Red. "Oracle provides developers with immediate access to a full lifecycle process management environment—including development, test, and production—and enterprise-quality tooling, without needing to build and maintain an IT infrastructure."